It is our opinion that LIFEBEAT is the most cutting edge and affective cardiovascular product on the market today. The ingredients in our product have been connected with improving heart health issues like high and low blood pressure as well as high cholesterol. The cohesive combination of ingredients in LIFEBEAT supports you with improved energy, vitality and a overall well-being feeling. LIFEBEAT is a highly nutritional product for people of all ages and all activity levels seeking to strengthen the functions of each of their body systems in order to maintain a balanced well-being. It is a product in liquid form highly nutritional a one-of-a-kind. It gives your body a complete mixture of amino acids, vitamins, minerals, antioxidants, phytonutrients and much more. Enjoy its’ smooth fruity taste! 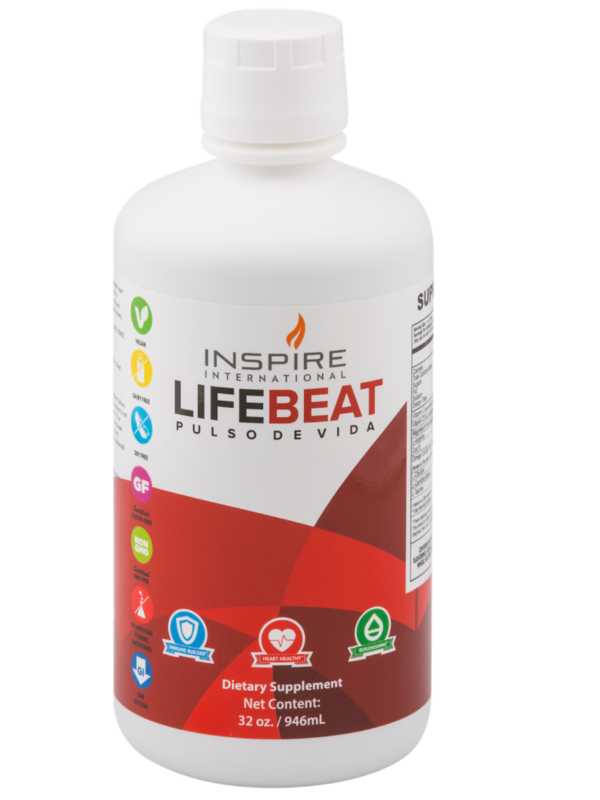 This smaller version of LifeBeat still contains all its nutritional values. A little bottle that has all the amino acids, vitamins, minerals, antioxidants, phytonutrients and much more. This is for those that need their daily intake on the GO! Just grab, go and enjoy! Try our LifeNutri Shake in the flavor of Vanilla! This superfood protein whose origins are from organic vegetables, is kept Gluten Free, GMO Free, Soy Free and Lactose Free . Its’ delicious flavor has a smooth silky texture that mixes hassle-free, leaving no clumps of protein powder behind. Now this is a great mix! For all our cocoa lovers, take a sip of our LifeNutri Shake in the flavor of Chocolate! Inspire International has partnered with the best team with over 50 years experience in the development of advanced products.We are constantly researching the latest innovations in nutrition and apply the findings to our formulations to meet the needs of our distributors and customers. Each product is designed to clean, balance and nourish the body, as well as create an environment that inspires total life health. We maintain a strict adherence to the highest quality standards. We certify that each step of the manufacturing process complies with Good Manufacturing Practices (GMP). We maintain a strict adherence to the highest quality standards. We certify that each step of the manufacturing process complies with Good Manufacturing Practices (GMP).Inspire International has a distinguished medical advice dedicated to research and education of all our distributors. These results aren’t always the normal results. With any kind of health program or physical condition, it is required to have a reasonable diet plan and physical activity be of a regular basis to reach your set weight loss goals. ALL results aren’t the same.